Starting in 1955, a company called United States Yttrium, (U.S. Yttrium), leased about half of the current 4.6-acre site with the intention of processing yttrium. Yttrium is a generally considered to be a rare-earth metal, that is generally found in conjunction with uranium ore. The main product of yttrium is phosphorus, which is found in cathode ray tubes,(television and older computer monitors), X-Ray machines, LED and LCD displays. The company contracted with the Spiegelberg Lumber Company of Laramie in 1956 to construct a processing plant complete with offices and an elevator. U.S. Yttrium went bankrupt in 1957, having only completed some early testing and processing. There was no commercially viable yttrium produced. All that remains is the large cinder block structure that incorporated two of the outer still bases, and six of the open furnaces between them. The eastern wall was constructed on top of one of the still foundations, with the furnaces being utilized as the primary structure for the second floor. The elevator was never installed, its shaft was constructed with the space between two of the furnaces as its ground floor opening. 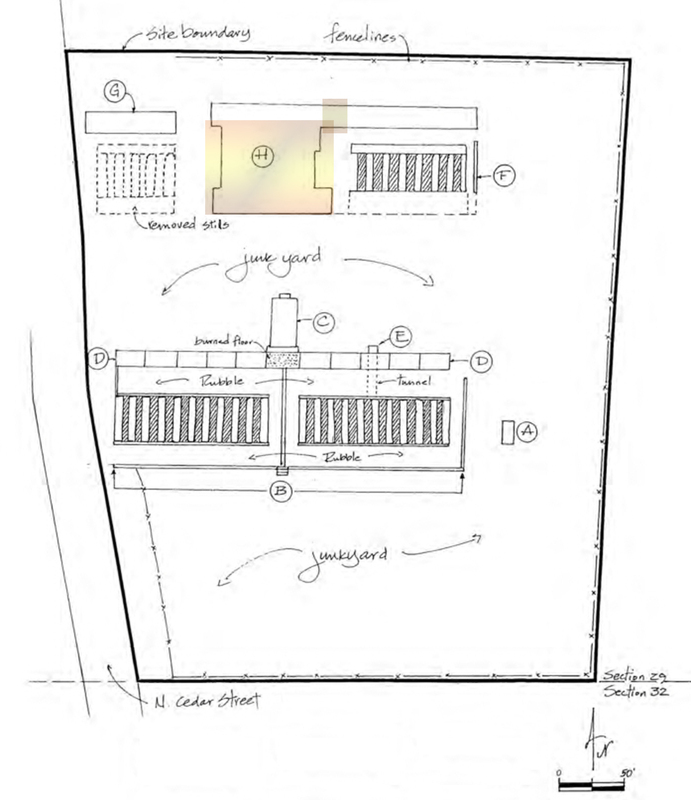 The two floors above and adjacent to the elevator shaft, (and its service shaft), have floors made of poured concrete, and are believed to have been planned as office and laboratory space, (this is merely speculation, as no records exist of the construction). The additional area highlighted to the right and above the main building is a small section, (roughly 20′ x 20′) that was also added during the construction. This was done in order to incorporate the north production line into the U.S. Yttrium building. 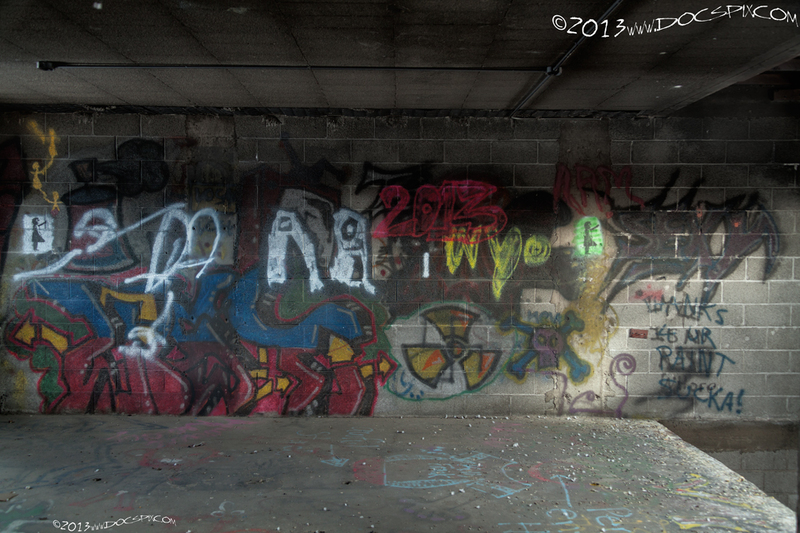 Note: images of just the still bases within the building are going to appear on the North Stills page. The United States Yttrium building, constructed in 1956. 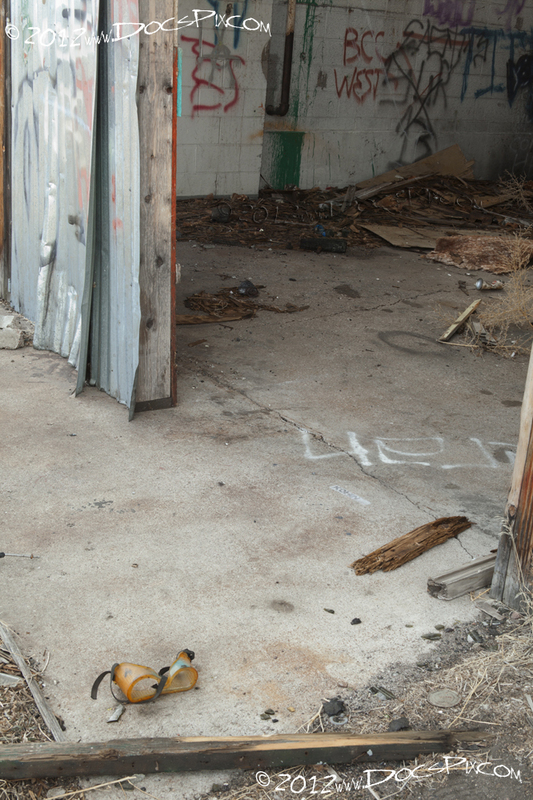 A pair of goggles lay on the concrete near the southeast door of the U.S. Yttrium building. Presumably discarded by a paintballer. The back of the main U.S. Yttrium plant. The poured concrete on the left is one of the still foundations. It’s topped by a wall with a stucco facade. The remainder of the walls are cinder block construction. The boat can be seen through the opening in the door to the left. The “line” of concrete was the foundation for the three story building that housed the stills. The building that joined the north production line, (the small highlighted area of the map). 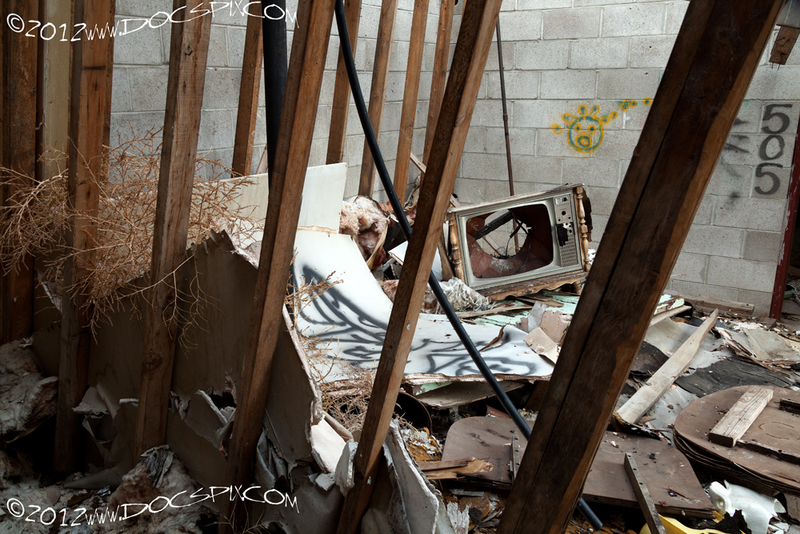 The television probably still has trace amounts of phosphorus. A view of the south factory floor. Another view of the south factory floor. The archways in the still bases are open through to the north side of the factory. These were originally used as furnaces for oil refinement. 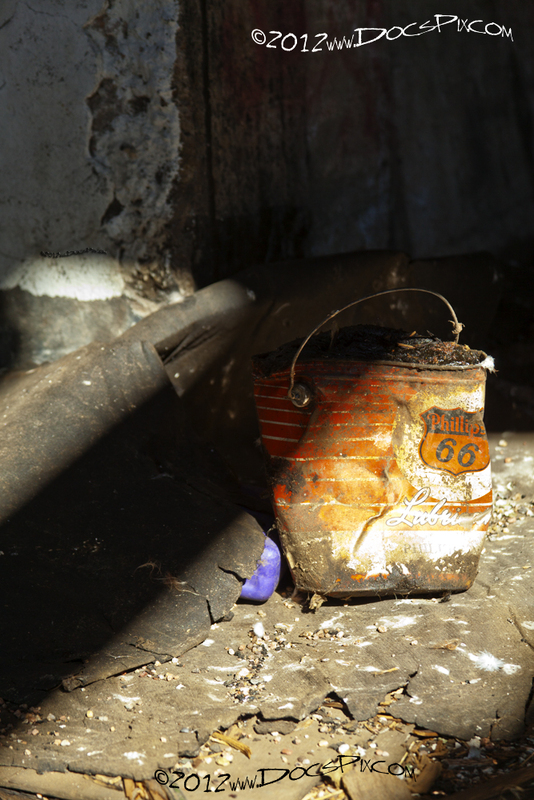 An old grease can rests on the floor. The opening left of the “Fear Factory” was for the elevator. The opening in the wall here was for the elevator. Looking south inside of the room where the elevator was supposed to go. The elevator control room was later used for storage. The original ladder was cut off to prevent access to the upper floors. The east wall of the second floor office/lab. The north east corner of the second floor. The north west wall of the second floor office/lab. The west-north-west wall of the second floor office/lab. Another view of the west wall as seen between the support pillars. The west-south-west corner of the office/lab. The opening was for the elevator controls. Detail of blue “con man”. Another view of the elevator control shaft with the elevator shaft on the the left. Detail of ladder that leads to the 3rd floor. A view of the third floor east wall. Note the concrete ceiling. Another view of the south factory floor. A 5-gallon can leaks oil on the floor of factory. 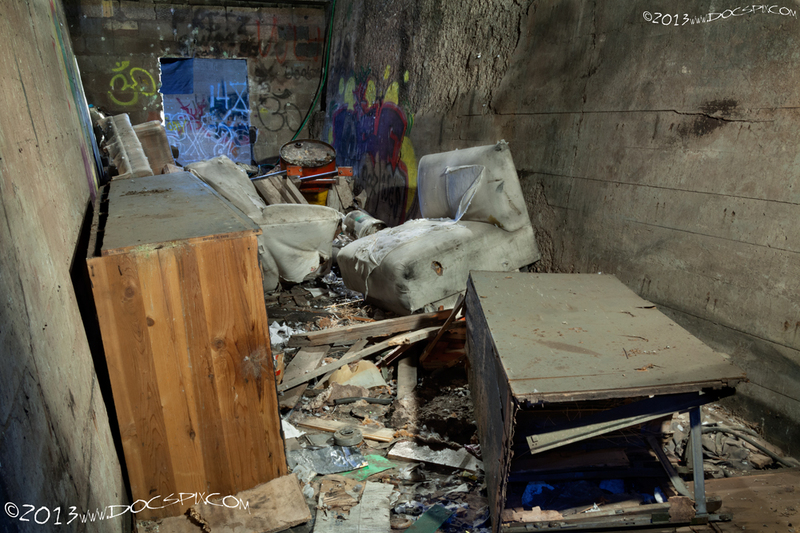 A number of oil containers and debris occupy the south west corner of the factory floor. A still base and the west wall of the building as seen from the north factory floor. The furnace on the left was used to boil crude oil for distillation. 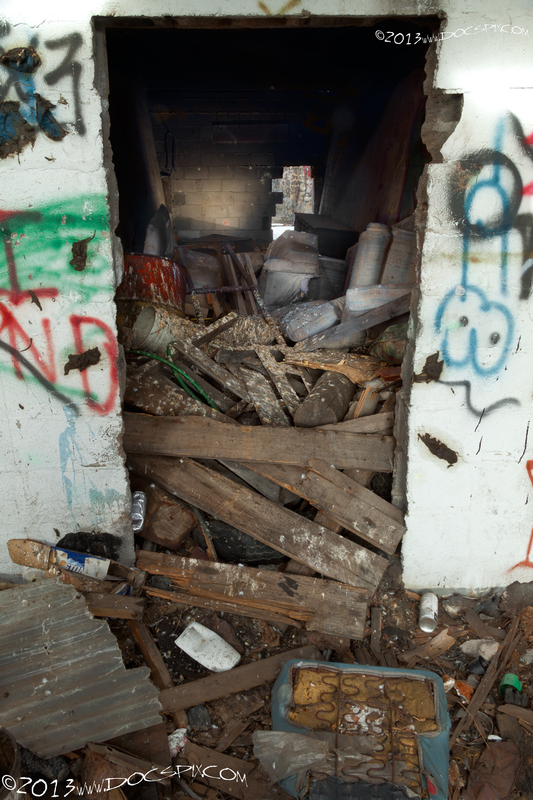 One of the interior walls on the north side of the building. One of the still bases and the wooden frame used to enclose the space. 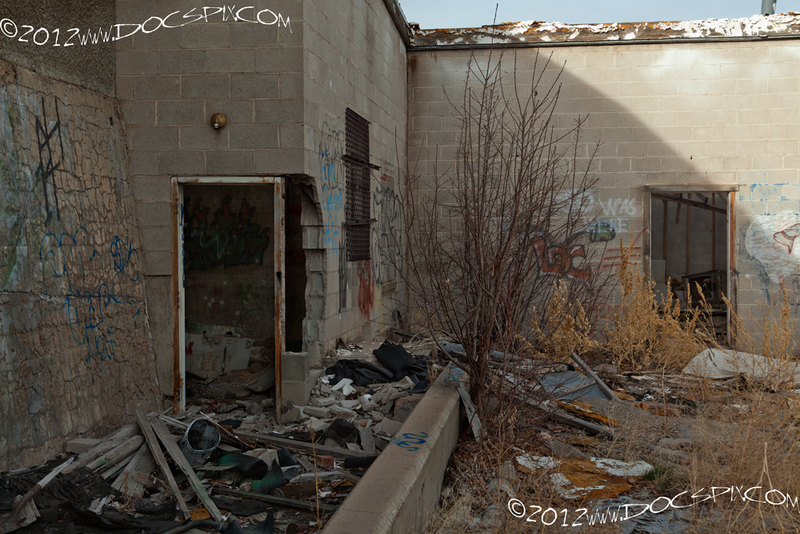 The opening in the cinder block wall leads to the elevator shaft. The furnace on the left is sealed on the south side of the factory. 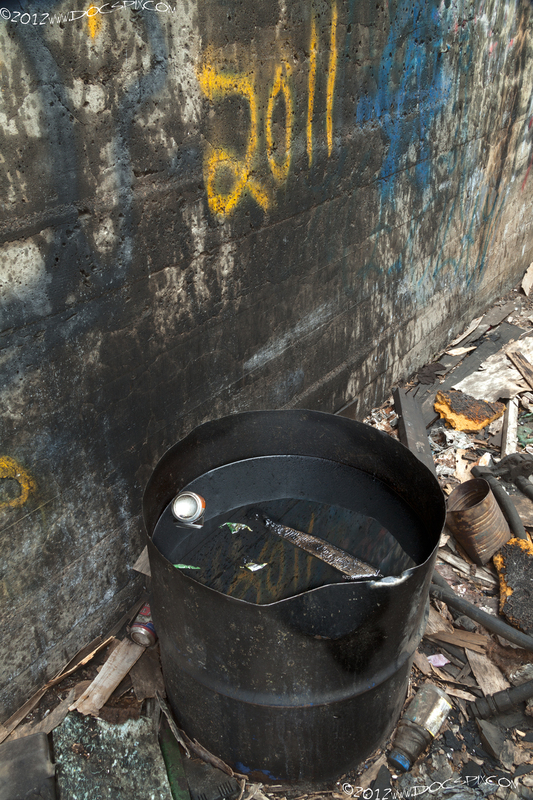 A half-oil drum sits next to the north wall of the factory floor. A view of the second floor looking northwest. Note the cinder block construction of the wall on the left as opposed to the poured concrete of the far wall. The far wall is a part of the northern production line. According to the manufacturer plate, this Evinrude “Sweet 16” was made in 1964. Looking down on the south factory floor. 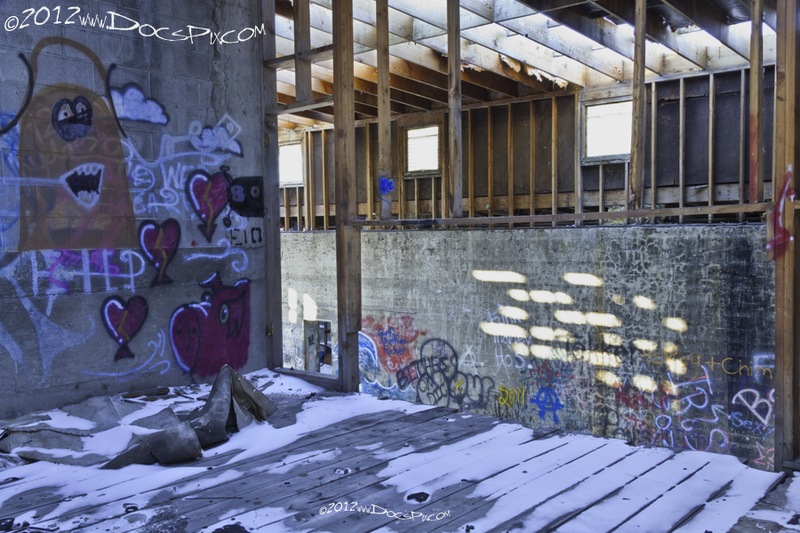 This heart was painted on one of the furnace/still walls, and is viewed through a hole in the wooden floor. 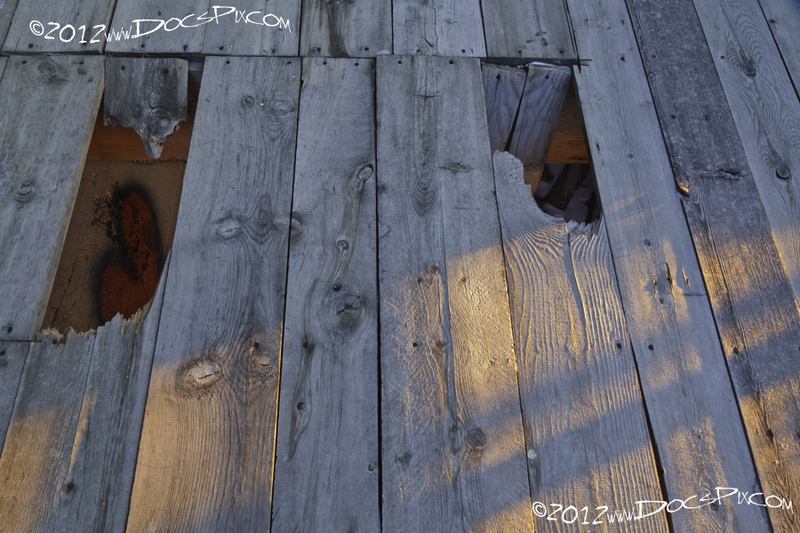 Two of the floorboards are broken on the second floor, the still foundations can be seen through the openings. 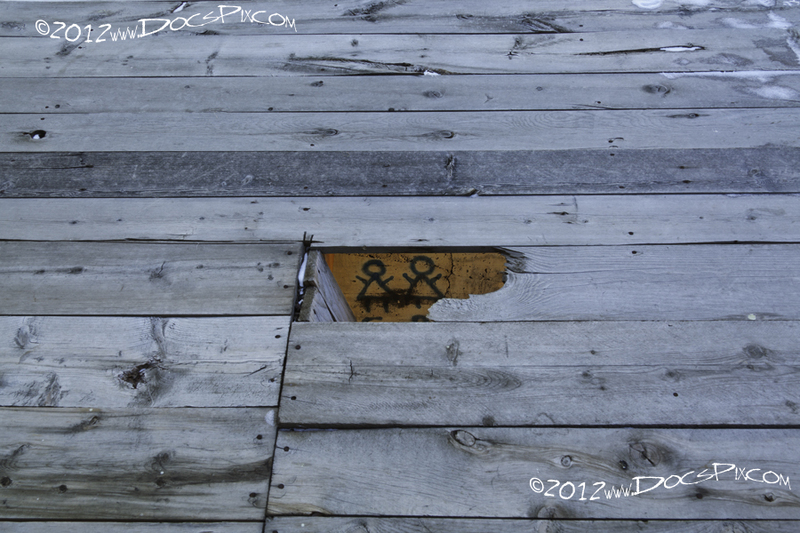 Stick figures painted on a still wall are seen through an opening in the floor. A conversation has taken place. WOW, the Evinrude… Open Your Eyes… and especially Blue Conman. Your photography really captures the vivid and fantastical essence of the paint on these walls. So I thank you, Sir, for honoring the graffiti art as well as the functional history of the buildings. Or perhaps it can be said that this ‘functional history’ *includes* the buildings’ use, once abandoned, as graffiti media (blank canvasses, if you will)? My mental math may well be wrong, but it seems that the buildings served this latter purpose at least as long (?) as they did their intended/industrial purpose. It also strikes me that the layers upon layers of graffiti comprise a rich though gritty social history in and of itself. I find myself wondering who some of these artists are or were (natives, residents, and drifters alike). I guess what I’m trying to say comes down to this. I enjoy seeing graffiti move through town on rail cars — a quick glance — like a postcard still in transit. 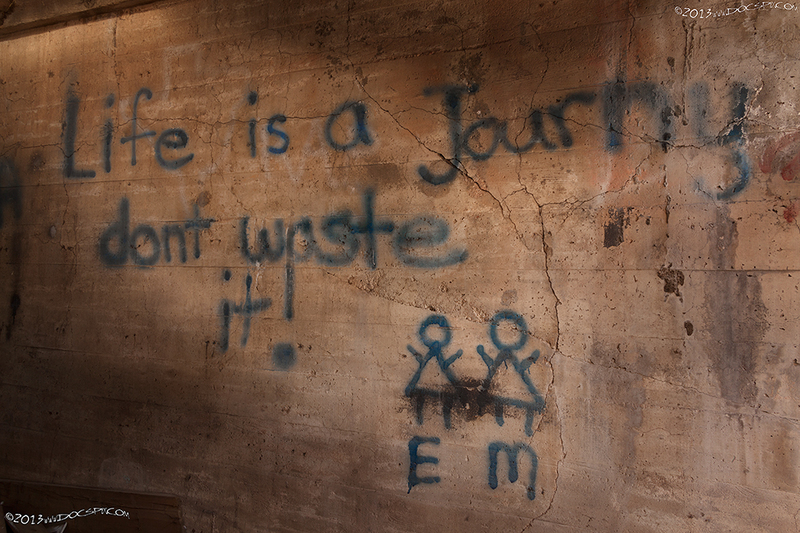 But the graffiti on the walls of these buildings is like a fascinating book written right here in Laramie — a book that is on the verge of being completed once the buildings are torn down — a book that would have been lost to all of us — a book that we can read, enjoy, study, and learn from only because you cared enough to share it. Thank you for your thoughts and comments! You’re not the only one wondering who some of these people are/were. I’ve been told that some of the three-digit numbers, (aside from the obvious “420”), are area codes. This may be an updated form of messaging similar to that of Independence Rock.